As I’ve said repeatedly in this space and others, I do not wear real fur. That’s a personal choice for me, and I’m not going to lecture anyone on why they should make the same decision. I merely wish that more designers would consider using faux fur instead of the real thing, particularly when they just need a little bit and warmth is not an issue. 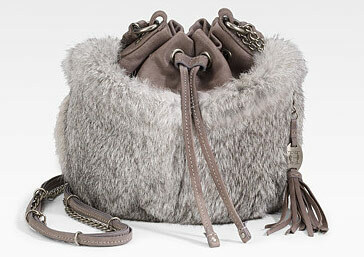 The Olivia Harris Fur Baby Ball Bag would have been a perfect opportunity to use high-quality faux. Joy Gryson, the designer behind the line, chose to use rabbit instead, which means that I can’t buy this particular bag. And that’s too bad – if it had been faux, I would have certainly considered it. Most fur bags look shapeless and puffy, but this one uses its small scale to its advantage and ends up being pretty cute. Perhaps I’m just far too used to looking at fall’s mostly abismal furry offerings, but I think that this one does a decent job of avoiding the blobby, fuzzy mess into which most other designs morph when fur is applied. (Ok, it’s still kind of a furball, but at least it’s a small one.) The small scale of the bag and reasonable length of the fur work with the bag’s round shape, and the leather peeking out the top keeps you from thinking it might be an actual animal on a strap. If only the fur was faux, I would finally be able to give a fur bag my seal of approval. Buy through Saks for $395.